Just regular folks. : End of the work week. End of the work week. It is the end of the week! Hooray! I'm feeling much better because it's my favorite time of the week, Friday night. Jeremy is making a 1 day business trip to Chicago today - it might be the first time where he's gone on a business trip without any extra underwear in his carry-on. He was suppose to get up at 5 am to make his 7:15 am departure time, but the alarm didn't go off. I woke up on my own at 5:30am and then mumbled to him that he was late already and then I heard mad dashing around the house and I suppose he was out the door at 5:38 am. He did make the flight and I think is getting on his homeward bound flight right now for an ETA into our house at midnight. We did manage to give Edda a haircut on Wednesday night. I know you can't look a borrowed camera in it's mouth, but the f 3.5 aperature is just killing me. My indoor shots are all way blurry. I guess I just need to set the ISO higher. In other interesting news, we are slowly getting the school system to work with Edda on using eye-gaze computer technology which is a pleasant surprise. I have not really pursued this kind of equipment for Edda on our own for a number of reasons, mainly because of cost and also because I know, like my beautiful piano or stationary rower which were kind of pricey things (but not as pricey as the eye gaze computer), I start off strong and excited about such things and then as it becomes clear that it's not instantly amazing and rewarding and is a lot of work, it ends up gathering dust in a corner and making me feel guilty. This is a pretty lame assessment of the situation, but it is what it is. So the school is going to do a lot of the work for me and they are excited about it. Although they did warn me that it's not easy and they have tried it on a number of other Rett girls in the county already and it was hard to get calibration and/or a long enough dwell time to make the eye gaze a produce a EUREKA! moment. I was not surprised about the difficulty in using the system, my surprise was hearing about the other Rett girls who were trialing eye-gaze systems. I know a few other Rett Syndrome families in the county, but the county's augmentative communication specialist seemed to imply that there were more families than those I am aware of and apparently they are more proactive than I am in pursuing communication goals. I feel a little like I'm a day late and a dollar short. This is also kind of a lame reason for not pursuing these special communications systems, it's more of an engineering reason rather than any sort of educational reason. 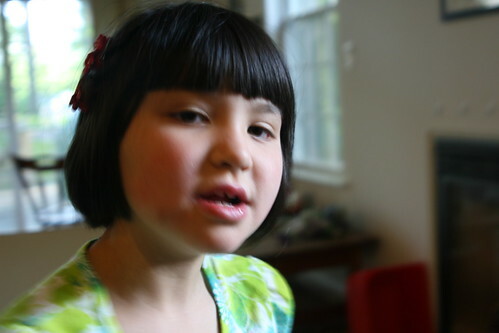 When Edda was diagnosed 4 years ago, the eye gaze technology was really not readily available and the Rett Syndrome community was excited about the Tango. The Tango is a touch screen driven communcation system which is rather cute. I was talking on the phone with the Tango sales rep a few years ago and complaining to him - why does it have to cost $8,000? Couldn't they just put their software on an iPhone and make it available for something like $500-$800? He answered back that the Tango did so much MORE than the iPhone and I replied that the Tango DID NOT MAKE PHONE CALLS. It now occurs to me that the could put it on the iPad and hopefullly it would still be quite a bit less than $8,000. Anyways, I know it's a supply/demand situation, there are never going to be as many people who want augmentative communication devices as those who want the iPhone, but I'm hoping that the prices go down. $8,000 - $17,000 is way too much money for me to spend on something that I think needs to be cheaper. I'd rather buy a minivan. I love this blog! I haven't been on it for a few days and so much has happened. I love the haircut. Tomorrow I'll read about the eye gaze stuff/machine. I like the back green tile and the forward white subway tile. Doris you have perfectly explained my feelings on communication devices! I understand the economics of it - but it doesn't make me feel any less robbed. Not to mention Brooke has had the opportunity to try each of the eye gaze devices on the market but doesn't seem so fond of actually using them. I'm sure with practice that would improve but is it worth the gamble when you know the technology is only going to improve and the price will likely come down? We are looking at the iPad - there is a app (proloquo2go) that looks amazing - and for $189. They have video tutorials on the website that show what it is capable of. We just finished a grant application to hopefully fund one for Brooke. If that doesn't work out I can handle the idea of spending $800 on a system more than $8,000. I can feel for you. The Dynavox is so expensive but we are lucky the insurance covered it. I also like the ipod one, we bought the other program Proloquo2Go from iTunes which is as good as Dnyavox and more handy and much more cheaper. Natasha is using both in the OT and ST.
Just like the computer or cellerphone, ever couple years come out new stuff and it will make you thinking to buy the new one. Now we have to find another way to buy the speaker for iPod and couldnt find the right one here in Singapore, as usual have to get it from USA. Have you look at the Proloquo2? I have heard about the proloquo2 for the iPhone/iPad, but I'm afraid that those are touch screen based and that since Edda can't use her hands, we are pretty much out of luck. I guess I'm hoping the eye gaze technology gets cheaper as well. Maybe I should go ahead and look into getting it for the iPad. I don't know. Actually, I know what will happen if we get the iPad for Edda is that everyone else in the house except Edda will end up using it. Maybe I'm wrong. Who knows. Yeah, I think we are going with the white subway tile. Warning: this is a poop post. I know, I'm a little behind the times. Seeing a lot of doctors. Buying prevacid and other news. A little too much scheduled. Coldness and Gila Cliff Dwellings.